We boiled one small lobster to make the sauce for the haddock in this recipe because precooked lobster meat was almost twice as expensive in the local market. Preheat oven to 400 degrees-F. Place fish in a glass or metal casserole dish. Cover with skim milk. Cut 2 Tbsp. butter into small pieces and place on top of fish. Bake for 20 minutes. Roughly chop lobster meat and set aside. Melt remaining 2 Tbsp. of butter in a large skillet. Add lobster meat and saute for 3 minutes. Add flour and stir with a whisk to make a roux, cook for 3 to 5 minutes or until flour is golden brown. In a separate pot warm the milk but do not boil. Slowly add warmed milk to the roux over medium heat and stir with a whisk while sauce thickens. Add paprika for coloring and stir. Transfer baked fish to plates to serve, discard milk and butter cooking liquid from the casserole dish. 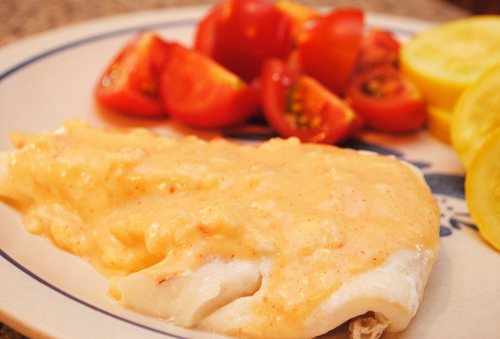 Cover fish with approximately 1/2 cup of lobster sauce and serve warm.